Because of these things and much more, successful SIs learn how to work very efficiently. When a tool or system can be utilized to make projects more streamlined, SIs will seek to redeploy that tool or system on other projects to help overcome the obstacles mentioned above. In the course of providing solutions to customers, Panacea Technologies not only found a great technology to improve their customer’s computing, they also found a way to create a new offering that has the potential to change the benchtop and small-scale reactor space for the better. That technology is ThinManager from Rockwell Automation. 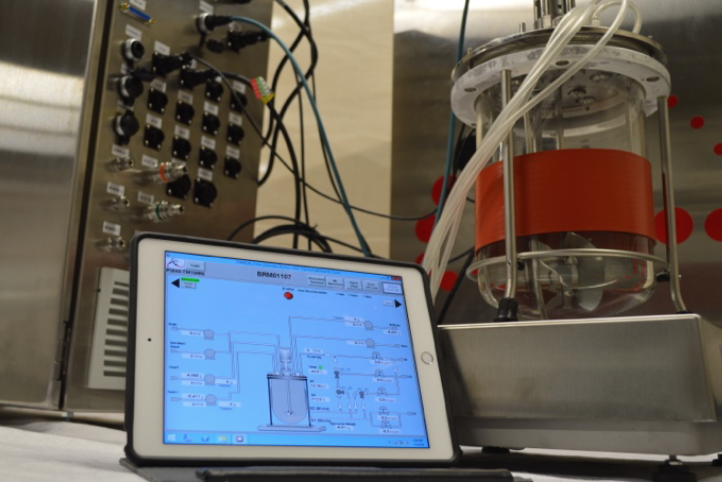 The current state of the benchtop and small-scale bioreactor market allows limited interaction with the reactors. Some facilities may have hundreds of reactors that need to be controlled and monitored. The issue is that these systems often use proprietary HMIs that have rigid limitations on how many units can be connected. Currently, many operators simply have to deal with monitoring one or two bioreactors at a time from a fixed terminal. “We once saw an operator running around with kitchen timers, paper notebooks, and a Microsoft Surface all while standing in front of the proprietary HMI,” said Will Aja of Panacea Technologies. Besides making lab operations inefficient, these systems have no real way of controlling user access. Panacea Technologies decided they could apply ThinManager to help solve these issues. What they have developed is not only a solution, but a whole new product to offer to their pharmaceutical customers. Panacea knew that mobile tablets would be an excellent way to overcome many of these issues. But seeking more than just a mobile connection, Panacea also wanted to provide access to more reactors at a time. While ThinManager is well known for its thin client management capabilities, it also provides the only location-based mobile solution available. By combining ThinManager’s mobile capabilities with many of the standard ThinManager features, Panacea was able to overcome a multitude of pain points. In fact, they overcame so many pain points that they essentially created a new platform for the industry. They call it OpenBIO. We asked Mr. Aja to explain how ThinManager helped create this new platform. Below he describes the ThinManager features that support OpenBIO. Panacea Technologies plans to continue using ThinManager for new thin client and mobility projects and the continued development of the OpenBIO platform. While there are countless reasons that system integrators choose ThinManager, Mr. Aja sums it up pretty well. Needed to overcome limited access to bench-top and small-scale bioreactors as well as dated methods for operating and monitoring the units. ThinManager’s Relevance mobility solution allowed for integration of QR codes on each reactor to manage access, control and monitoring from mobile tablets. Other ThinManager features made it possible to restrict access to the applications needed without requiring full desktop access. ThinManager removed the need for operators to manually access terminal servers and manually switch between sessions. ThinManager’s mobility solution, Relevance, allowed controlled access to bioreactors through QR codes. ThinManager also expanded access to multiple benchtop and small-scale bioreactors creating a much more efficient work environment for the operators. The ThinManager features all combine to create a seamless end-user experience. Panacea typically uses ThinManager for other solutions as its built-in features help overcome many modern system integration challenges. Panacea Technologies Inc. is a Process Control and Automation services company headquartered in Montgomeryville, PA with offices in Irvine, CA and Albany, NY. Panacea has been delivering cutting edge solutions to our clients since 1996. We remain committed to delivering superior solutions to our clients in the Process Industries including Pharmaceutical, Biotechnology, Oil, Gas, Chemical, and Industrial Gases as well as Brewing and other Food and Beverage arenas. Panacea’s competitive edge can be largely attributed to our technology focused expertise in automation solutions, information management, and services. We have been providing a full suite of project services ranging from feasibility studies to implementation and long term support for over 20 years. For our Pharmaceutical clients we also provide automation validation services with an emphasis on 21 CFR Part 11 and ISA-88 based system validation.